A core component of any IT support service is the Service Desk. The Service Desk is the home of the engineers that solve your urgent issues and keep your IT systems running effectively. Most Service Desks work in a very similar way. 1st line technicians answer calls and provide basic troubleshooting, many problems are solved at this stage. If 1st line staff can’t solve an issues it is escalated to 2nd line. 2nd line will be more skilled and experienced and will be able to solve more complex issues. However, if they are unable to solve an issue they will escalate to 3rd line. These are the most experienced engineers and are able to solve the most complex of issues. Field engineers support the Help Desk and can be dispatched on-site when an issues cannot be resolved remotely. At Your IT we do things slightly differently. Our Service Desk staff are arranged into teams of 4, led by a Senior Engineer. Whilst the Senior Engineer provides a point of escalation the team works together to problem solve. Consequently, simple issues can be resolved by any team member whilst escalation takes place much more quickly. Because we encourage the team to work collaboratively they are constantly updating and sharing knowledge. This increases the ability of all engineers across the team and, as a result, improves the service provided to our clients. Whilst Your IT has grown we have wanted to retain the level of service our clients expect. As we have brought more engineers into the business arranging the engineers into teams, and dividing clients between teams, has been fundamental in retaining a personal, bespoke service. As a result of dealing with a smaller number of clients Service Desk staff establish better relationships with clients. This allows them to better understand the systems used in each business. Clients can contact the Service Desk via telephone, email, live chat or web form from 7am – 6.30pm, Monday to Friday. We answer all calls within 60 seconds. On the majority of occasions you’ll get straight through to an engineer. If you don’t, you’ll speak to another member of our team. They will take your details and an engineer will return your call within 15 minutes. Once you’re on the phone the engineer will take responsibility for your issue. They will perform ‘triage’, asking for some simple details and performing basic troubleshooting. 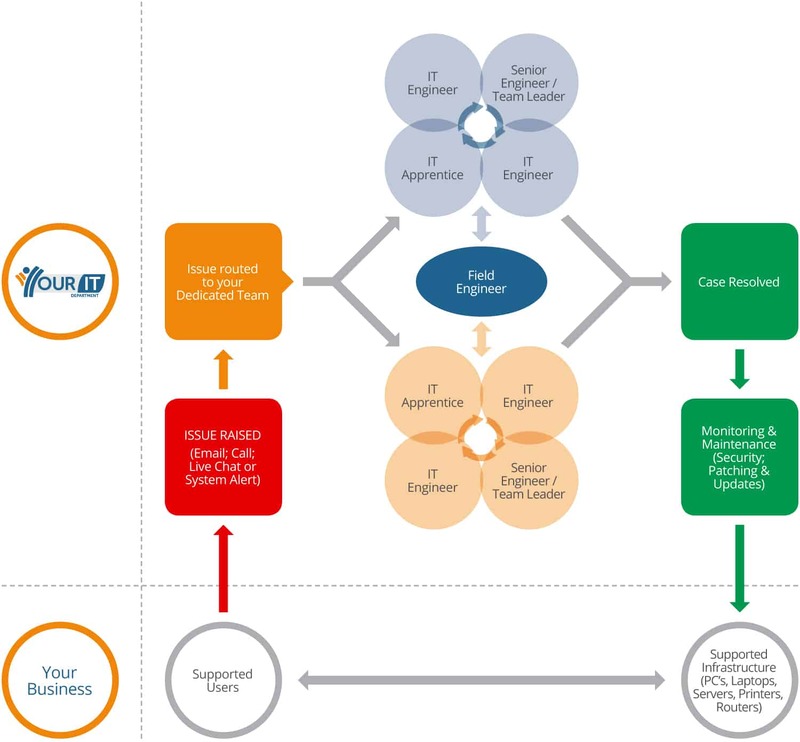 In around 85% of cases this engineer will be able to fix your issue within the first call and normally within a few minutes. If the engineer ascertains they’re unable to perform a fix within thirty minutes they will escalate the issue to a Senior Engineer. The Senior Engineer prioritises the issue using a priority matrix. The most critical issues are those that affect the whole organisation or are stopping one or more business processes. The Senior Engineer will investigate the issue and communicate an estimated time for a fix. 95% of issues are fixed remotely and any high priority issue will be fixed within 8 hours. We can also dispatch engineers to site where needed. 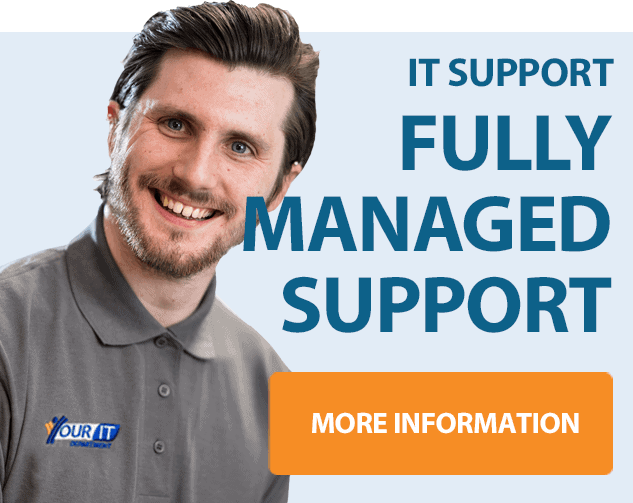 On-site repairs are included in our Fully Managed IT Support package. We communicate throughout the process via our ticketing system which updates you by email and by phone directly from the engineers. Changes include setting up new users, installing new software and updating existing software, installing new printers. Working on anything that’s not broken, basically! This work is scheduled in engineers’ diaries and the clients is informed when it is due to happen. We try to schedule shutdowns and reboots at times that suit clients to avoid disruption as much as possible. Most minor changes will be carried out the same day but we do ask for a minimum of 7 days’ notice wherever possible. Whilst we will provide clients with SLA’s as part of their agreement, these reflect our minimum service level. We are proud to share our service goals, the stretching service targets we set our Service Desk Staff. Following each interaction with our engineers users will have the opportunity to let us know if everything went OK. We share our current Customer Satisfaction Ratings via our website. We monitor feedback carefully and if there has been an issue we may call for further information. All negative and neutral feedback is investigated to ensure any problems are fully solved and do not reoccur. Our latest customer satisfaction score is on our Home Page. Our CSAT score for the current year to date is 97.9% and our score since starting to use the Smileback system (March 2017) is 95.7%. From a total of 2325 reviews we have only received 23 negatives. Finally, our current record ‘run’ without a negative review stands at 112 days.